When tested by Western blotting on TNF alpha stimulated HeLa lysates the antibody detects a single clean band of about 27kD. This band is only blocked by the phospho peptide immunogen and not by an equivalent non-phospho peptide or by a generic phospho peptide. This confirms that the antibody is specific for phospho S82 of Hsp27. HeLa cells treated with TNF alpha. The antibody has been negatively preadsorbed using a non-phosphopeptide corresponding to the site of phosphorylation to remove antibody that is reactive with non-phosphorylated HSP27. Our Abpromise guarantee covers the use of ab17937 in the following tested applications. 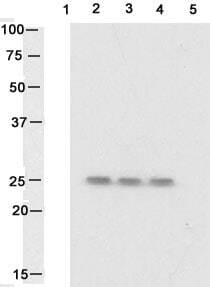 Western blot using ab17937 on HeLa cell lysate. Lane 4: TNF-α Stimulated HeLa lysate blocked with generic phospho-serine peptide. Lane 5: TNF-α Stimulated HeLa lysate blocked with phosphopeptide immunogen. Publishing research using ab17937? Please let us know so that we can cite the reference in this datasheet. There are currently no Customer reviews or Questions for ab17937.